by Brianna Crandall — September 28, 2018 — Nearmap, a premium global location content provider specializing in high-resolution, aerial maps, flew and captured areas in North and South Carolina impacted by Hurricane Florence both before and after the storm made landfall on September 14. The company says this imagery is already supporting the extensive post-disaster cleanup and reconstruction efforts across the wide ecosystem of public safety, utility companies, insurance agencies, business owners and numerous contractors in many industries. High-resolution captures from the Wilmington and Myrtle Beach areas were online and available for immediate use as of the company’s announcement September 24, with more areas scheduled to come online over the following several days. The post-hurricane coverage includes about 4,530 square kilometers around the coastline from Newport, NC, to Myrtle Beach, SC, covering a population of about 752,000 people. Before the hurricane, Nearmap had already covered more than 30,000 square kilometers in North and South Carolina with ortho imagery and more than 12,000 square kilometers with oblique imagery. With previous aerial maps taken at least once a year totaling over 140,000 square kilometers online, some of them dating back to 2014, users are able to compare current imagery with historical photos. A key element to the recovery efforts is having access not only to high-resolution imagery from after the storm, but also to historical aerial captures from before the storm hit. Historical captures provide consistency and contrast, enabling crews to look at the current truth on the ground and compare it to previous time periods to help assess the damage along the coastlines. All pre- and post-hurricane imagery can be accessed through a standard web browser using Nearmap’s intuitive MapBrowser, through Nearmap partners, or via APIs to integrate with common GIS, CAD and other applications. 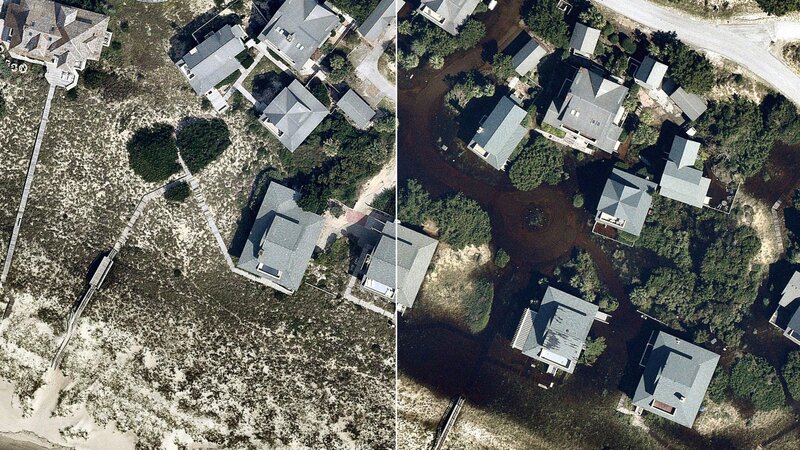 All the Nearmap pre- and post-hurricane imagery is published at sub-3” Ground Sampling Distance (GSD), which allows users to see great detail on the ground. At this resolution, users can clearly identify important ground conditions such as roof blow-off, property damage and flooding. The same is true for streets and all other ground features, providing details for users to complete analysis both before and after storms. Public safety: Access to immediate, crystal-clear aerial imagery of areas affected by storm damage for emergency response routing and safety. Utilities: View all areas where above-ground utilities have been affected, and also see where infrastructure is down or damaged and causing hazards. Reconstruction efforts: Compare historical image captures with post-event imagery to see structure elements and provide proper measurements to rebuild. Insurance: View impacted properties to see first-hand damage and potential structural damage. Our thoughts are with the residents of North and South Carolina recently impacted by the hurricane. We are pleased that Nearmap customers are using our imagery to help restore these neighborhoods, and help residents fix and rebuild after rooftop, flooding and other damage. To see some of the images captured, including historical comparisons in the area impacted, visit the Hurricane Florence Aerial Image Galleries Directory. The company also invites those interested in the technology to view their current project in Nearmap. Need robust lighting for your next project? Bosch’s portable LED work light offers Bluetooth control from your phone March 22, 2019 In "Products and Services » Lighting"
See how this cost-effective rotary hammer shroud keeps dust contained, without a vacuum May 2, 2018 In "Products and Services » Safety and Health"
Supply chain software giant uses high tech prefab to wow clients November 11, 2018 In "Case Studies » DIRTT"
If you use MasterSpec for a project, this new partnership will make it easier to find green building products July 6, 2018 In "Products and Services » Publications"